Within Gator Creator we now have a Test Centre which is currently in Beta mode. This newly designed centre is a much easier way to see what you're possibly missing from your email content, including Jonny's Design Checklist and our Automated Checks. To access the Send Test Centre, select 'Test Send'. Please Note: This is designed to provide a visual preview of the email only. Any tracked links, dynamic content, and merge fields in your email will not work and should be tested via the Campaign Send Test Tab. Here you can view your email as it would appear Live. You can change the view to see it in Desktop, Mobile, Tablet, or both. Enter your email address here, or the address of the person you wish to receive the test send. Select whether it will be in HTML format, Text format or both. This means you will receive these formats in your inbox. The automated checks are here to help advise you on features you should include. The symbol will change depending on if you have included them i.e. if you have an description set on one of your images it will have a green tick next to it. 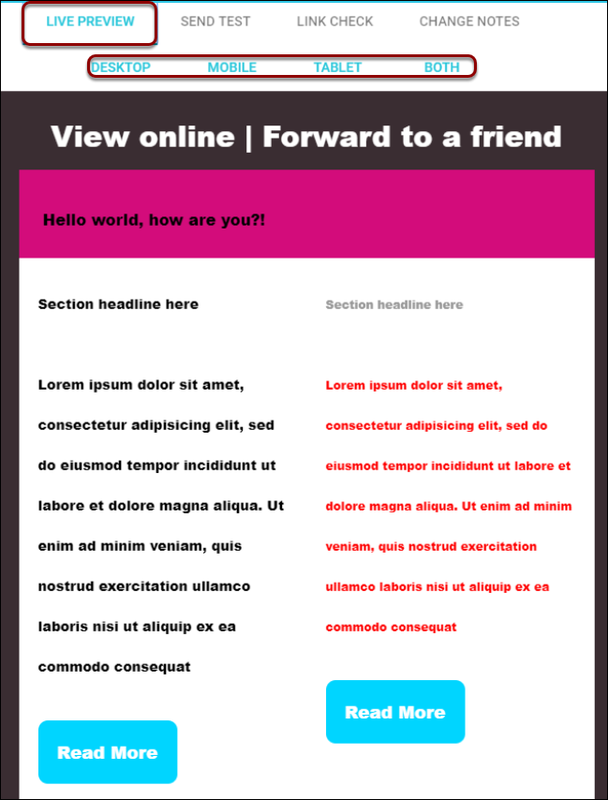 Please remember that this test send is to visualise your email design in your email provider. It does not test content, meaning dynamic content, merge fields, and tracked links WILL NOT WORK and they will ERROR. Select 'Send Test' when you are happy with your email design. Here you will be informed how many links are in your email. This will tell you how many of those links are working. All of your links will appear in this section as a list. If they are green it is a working link, if it is red it is not working and should be edited. Clicking on the link will open it in a new tab. To edit your link click the blue pencil icon. To refresh the list press the refresh icon. Here you can add notes to describe changes you have made or want to be made, if something is not working (like a link), and if you want to track employee progress/changes.